"dark cabinets with white island"
Transitional galley kitchen featuring dark, raised panel perimeter cabinetry with a light colored island. Engineered quartz countertops, matchstick tile and dark hardwood flooring. Photo courtesy of Jim McVeigh, KSI Designer. Dura Supreme Bella Maple Graphite Rub perimeter and Bella Classic White Rub island. Photo by Beth Singer. Linda Oyama Bryan, photographer Raised panel, white cabinet kitchen with oversize island, hand hewn ceiling beams, apron front farmhouse sink and calcutta gold countertops. Dark, distressed hardwood floors. Two pendant lights. 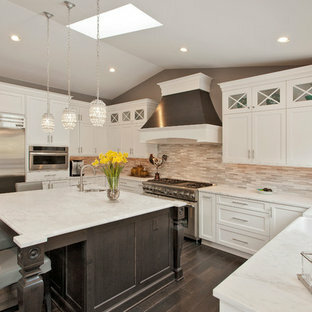 Cabinet style range hood. Linda Oyama Bryan, photographer Raised panel, white cabinet kitchen with oversize island, hand hewn ceiling beams, apron front farmhouse sink and calcutta gold countertops. Dark, distressed hardwood floors. Two pendant lights. Kenneth M. Wyner Photography Inc.
Beauty in the Details Project Details Designer:	Amy Van Wie Cabinetry: Brookhaven I – Frameless Cabinetry Wood: Maple Finishes:	Antique White on Perimeter; Distressed Black Espresso Glaze on Island Door: Perimeter – Edgemont Recessed; Island – Edgemont Raised Countertop:	Grey Soapstone Awards 2013 Parade of Homes, Pinnacle Homes-Best Kitchen 2013 NKBA Tri-State Award Columbia Cabinets designed the cabinetry for this stunning home that was featured in the 2013 Parade of Homes and is a multi-award design winner. After the initial meet with the clients and Witt Construction, I began to think about how the space could work. The cabinets were crafted with Edgemont Recessed doors in maple with an antique white finish…a perfect selection for the kitchen’s traditional/coastal design. For countertop, I suggested modern grey soapstone. With a nod to today’s popular trend to mix and match finishes, the island was completed in a black espresso glaze distressed finish with maple Edgemont Raised doors. What really distinguishes this project is the attention to the details. Along the refrigerator wall, the shelf area has lowered seeded mullion glass cabinets and a valance. This created an airy, open look within the space. 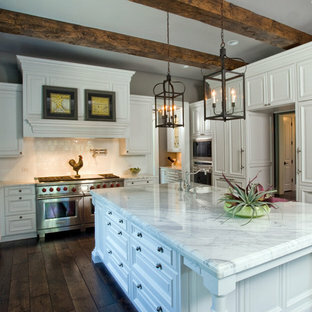 The bead board accents and corbels throughout the kitchen complete the design. In the design stages many details were incorporated in this classic kitchen to give it dimension since the surround cabinets, counters and backsplash were white. 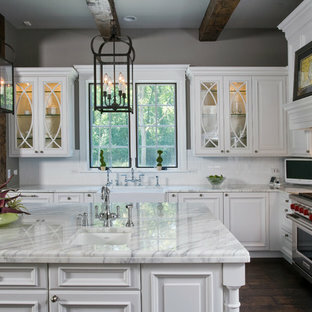 Polished nickel plumbing, hardware and custom grilles on feature cabinets along with the island pendants add shine, while finer details such as inset doors, furniture kicks on non-working areas and lofty crown details add a layering effect in the millwork. 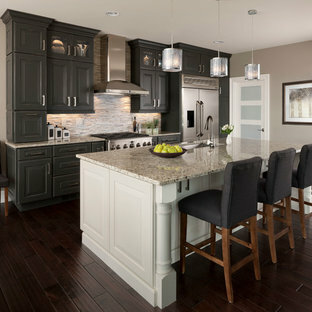 Surround counters as well as 3" x 6" backsplash tile are Calacutta Gold stone, while island counter surface is walnut. 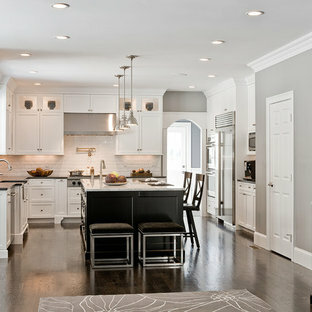 Conveniences include a 60" Wolf range, a 36" Subzero refrigerator and freezer and two farmhouse sinks by Kallista. The kitchen also boasts two dishwashers (one in the island and one to the right of the sink cabinet under the window) and a coffee bar area with a built-in Miele. Photo by Pete Maric. 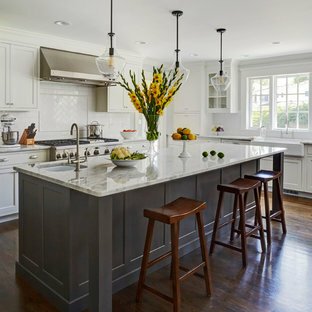 By Garrison Hullinger Interior Design Inc. This white kitchen is grounded by the dark espresso island. Carrara marble island with wine storage on the side create a beautiful contrast to the white cabinets with the silestone grey countertops and herringbone backsplash tile. This kithchen renovation included the removal of a load bearing wall to open it up and make it feel bright and airy.